Managing children can be tough at times, especially when you have other things to take care of as well. Sometimes, you just wish they could be distracted by themselves for a few hours while you plummet through the day. You can now entertain your children, and still get things done when you’re out and about, with this spectacular Grab & Go Mobile. Not only will this fun and vibrant design bring laughter and happiness in to your baby’s world, but it is also a great way to improve their vision, hearing and emotional skills. 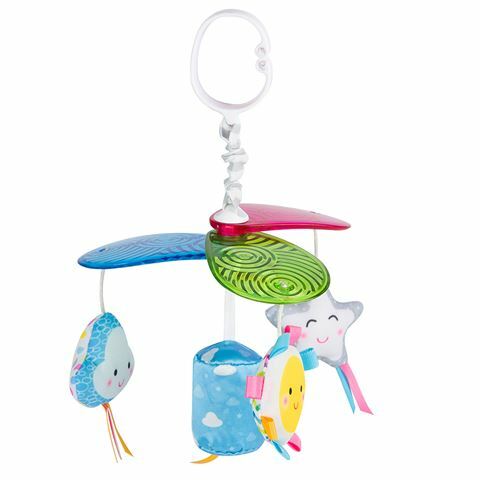 With a unique front view hook, this mobile is easily attached onto the front of your baby’s stroller, making the child’s travel session entertaining and learning worthy. Crafted from polyester and plastic stiffener. Suitable for ages zero and up. Bell sound emerges from the toy, helping babies develop their hearing skills. This mobile is ONLY for strollers.